Have you invested in some warm, cozy suede and sheepskin boots for those chilly winter months? Are you now wondering how to clean Bearpaw boots after the battering they will take from snow and rain? Most of us know how to care for and clean leather boots. There are polishes, creams and oils to get rid of the grime and make them look new again. However, suede uppers on boots might not be as easy to clean. Let’s look at how you can keep the inside and outside of your Bearpaw boots looking good and smelling fresh. 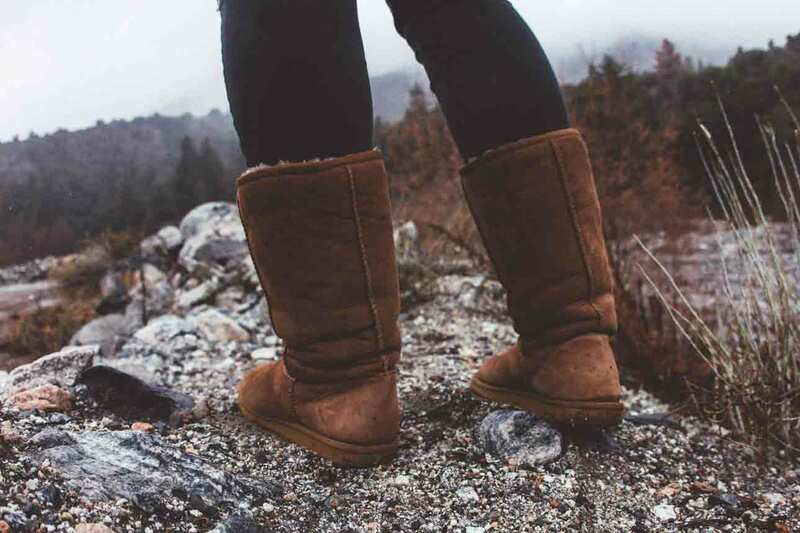 What Are Bearpaw Boots Made From? Bearpaws are made from suede outers, lined with woolly sheepskin. They are designed for ultimate comfort, while keeping your feet warm and toasty in colder weather. They have sturdy rubber soles, to protect your feet from the elements and give you grip when things get slippery. This video describes some of the features of Bearpaw boots. Yes, suede is leather. It is from the underside rather than the upper of a hide from an animal. It’s the part of the animal skin that would have been in contact with the flesh. This part of the hide is sanded or rubbed, which raises the nap, or fibers. It results in a soft, smooth and pliable surface. Suede, while durable, is thinner than many other types of leather and can be more of a challenge to clean. Now we know what these easily recognizable boots are made from, it’s time to learn how to keep them clean and protected. Doing this will help prolong their life and keep them looking good. A suede brush will comb the outside of your boots, raising the nap and removing dirt and debris. It will keep the suede soft and also prepare it for other cleaning methods. Suede brushes are designed for cleaning the whole of the upper of your boots. This brush from Shacke has nylon bristles to raise the nap, and a welt surface to use on heavily stained areas. It also has a half-circle brush for rounded parts of the boots and a thin brush to get into hard-to-reach crevices. Make sure your boots are dry. 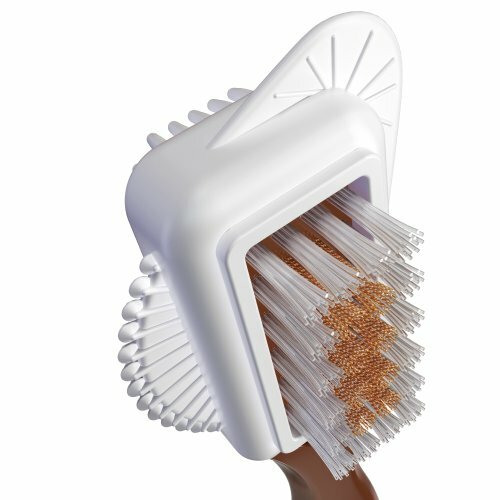 Brush gently in one direction with the nylon brush, to remove surface dirt. In areas that are scuffed, brush back and forth vigorously, using the welt surface. Use the crevice tool to remove dirt from areas between the sole and upper. Brush your boots regularly, to keep dirt and debris at a minimum and your boots in tip-top condition. There are specialist cleaning kits you can buy to help keep your boots in superb condition. Bearpaw produces its own cleaning kit for their boots. While this is a manufacturer recommended product, there are other suede cleaners available. 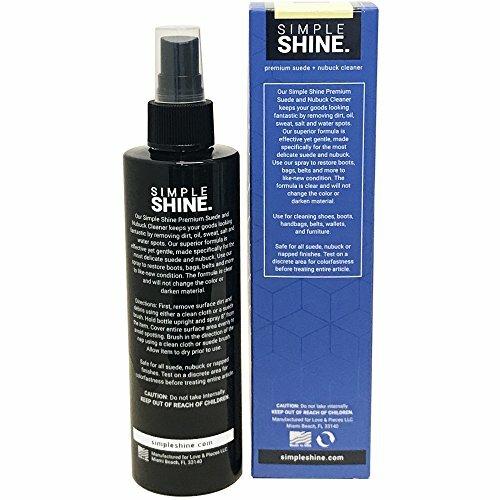 You could try this one from Simple Shine. Brush your boots to remove surface dirt and debris. Take a clean cotton cloth and soak it in cold water. Wring the cloth to remove excess water. Gently wipe the outside of the boots with the soaked cloth, to wet them. Ensure the whole surface is wet: this helps the suede cleaner to work. Dampen the sponge in cold water, make sure it’s not too wet. Squeeze a little of the cleaner onto the damp sponge. Using the sponge, apply the cleaner over the whole of the uppers of the boots, working it into the suede, working from top to bottom. Pay particular attention to any heavily soiled areas. Don’t rub too vigorously, or you might damage the suede. If you don’t cover the whole of the boots, you could get water marks, so make sure you don’t miss any parts. Once you have applied the cleaner all over the boots, rinse them off to remove the residue. To do this, use a wet cloth or cold running water. If you use running water, rinse the boots quickly so they don’t get too soaked. Stuff the boots with kitchen towels or newspaper, to help them retain their shape while drying. Allow them to air dry naturally, away from direct heat or sunlight, for about 48 hours. Once dry, use the suede brush again to restore the nap. Make sure your sponge does not get dirty when applying the cleaner, or it will spread dirt around the boots. Rinse it out and apply more cleaner if necessary. Add some silica gel sachets inside the boots when drying. These help soak up moisture. 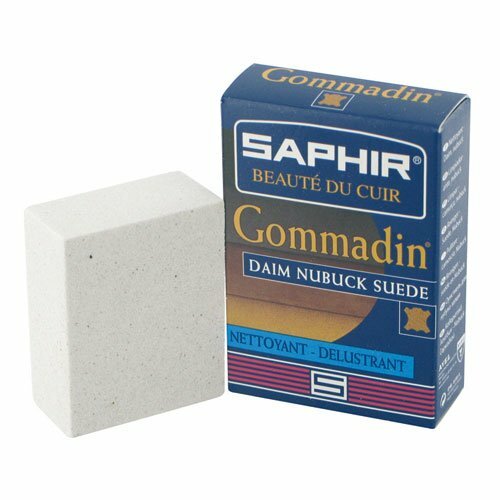 A suede eraser is similar to a pencil eraser, and can be used to try and remove salt stains or stubborn marks. These erasers are coarse-grained, to remove dirt and water marks. Applying a medium to hard pressure, rub the eraser over the stain. You will notice that the eraser leaves particles on the shoe. Take a suede brush and brush the area to see if the stain is gone. This process can be repeated until no marks are left. It will work well on dry marks and stains, but won’t remove oil or grease marks. This video shows you how to use a suede eraser. These might not be recommended by the manufacturer, but there are some DIY solutions you can try. They will help clean your Bearpaw boots and could remove some stubborn stains. Using the method we described for applying suede cleaners, you can substitute the cleaner with white vinegar. Vinegar works to remove marks without staining. This type of stain can be particularly stubborn and hard to remove. Try and clean it as soon as you can when this happens, to limit the damage. Cornstarch or talcum powder might be effective in removing grease or oil. Sprinkle the powder over the stain and press it in. The powder will absorb the grease or oil. Leave it overnight and then brush it off the following morning. Use your suede brush to restore the nap, or to remove what remains of the stain. A cotton ball that has been soaked in rubbing alcohol can remove ink stains. If the stain happens to be fresh, you can try and scrub it out with a fine grit sandpaper or a suede eraser. Chewing gum and wax can be a nightmare to remove. However, there is a simple trick you can try, to remove them easily. Pop your boots in the freezer for a few hours—you might want to put them in a bag first. When you remove them, the wax or gum will have become hard, and can be chipped off using a suede or nail brush. A simple way to get rid of a water mark is to use water. First, pop a towel inside your boots, then spray them lightly with water evenly over the uppers. Give the stained area a scrub using a nail brush, making sure you pay special attention to the edges. Use a damp cloth to blot the water. This helps ensure the boots dry evenly, and eliminates the possibility of water stains developing. Stuff the boots with newspaper to help them retain their shape, and air dry them. Once dry, brush them with your suede brush. The warm, woolly interior of your Bearpaws can also require a little attention from time to time. Holding the boot upside down, use a wide toothed comb to dislodge any dirt that might be stuck in the wool. This will then fall out of the boot. If your boots become a little on the stinky side, you can deodorize them with baking soda. Sprinkle about a tablespoon into each boot and give them a good shake to distribute it. Remember to cover the top with your hand so it doesn’t all fall out. Leave your boots overnight and shake the excess powder out the next morning. Can I Wash Bearpaw Boots in the Washer? Placing Bearpaw boots in the washing machine is not recommended. Saturating the boots with water could shrink or stretch them, and damage the suede surface. Stain and water-repellent sprays can help protect and prolong the life of your boots. 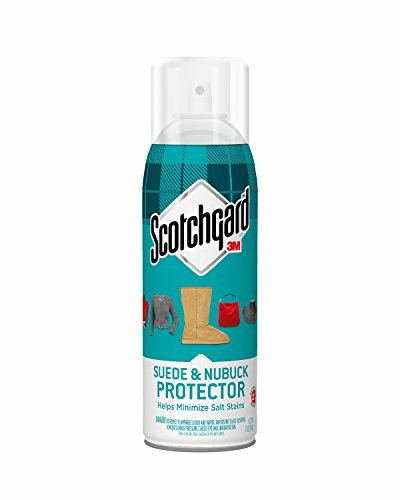 The Bearpaw cleaning kit contains such a spray, or you can purchase others, like this one from Scotchguard. It’s a good idea to use this type of spray from the get-go. The spray should have directions for use. In general, to use these sprays, first remove any dirt or debris with a suede brush. Evenly spray the entire upper of the boots, from a distance of 6–8 inches, until the boots are wet, but not soaking. Leave the boots to air dry in an area that’s well ventilated, for about 24 hours. Caring for your Bearpaw boots from the minute you get them out of the box will make sure they stay looking good. As the proud owner of a pair of these, I had a vested interest in learning how to clean Bearpaw boots. I hope you enjoyed the results of my research and found it useful. Investing in a cleaning kit and a suede brush will provide the main tools you need to keep your boots in tip-top condition. We tend to expect a lot from them, the least we can do is look after our investment in return. This video details some of the methods we have discussed for cleaning suede. We would love to hear your thoughts. Please leave us a comment and don’t forget to share so others can benefit from good looking boots too.